This guide highlights Okanagan College Library's general science resources, including reference sources, award-winning books, magazines, DVDs and streaming videos. The electronic resources included in this guide are licensed for use by students and employees of Okanagan College. You must authenticate to use those licensed resources. Log in with your myOkanagan username and password when prompted. Books, magazines and DVDs which are not located at your Okanagan College campus library may be requested in the Library's catalogue. How strong are spider webs? 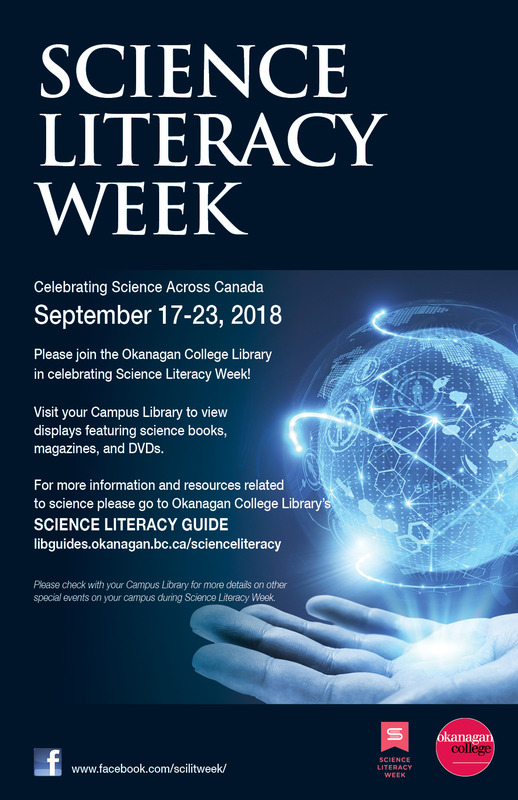 Discover the world of science with displays of science books, periodicals, databases, and DVDs at each of the four Okanagan College Campus Libraries. As part of national Science Literary Week, this event promotes public awareness of science and highlights resources available. Visit the Library webpage or your campus Library for more information about displays and events at each campus Library. Science in Society Speakers Series, Okanagan College, Vernon Campus.